For centuries natural ingredients have been part of every fashionable woman's beauty regimen. From the days of Cleopatra and her use of kohl to line her eyes to Marie Antoinette's rose petal milk baths, legendary beauty is simply natural. These days the beauty experts are going to the next level using organic products to create some of the most luxurious creations to beautify the modern woman. At 98 percent organic MD Skincare takes the top spot on this list with their new line of spa products packed with aloe, jojoba, tea tree, and more. The Purifying Bath Crystals ($42) smell delicious and are a combination of CoQ10 that detoxifies and organic aloe to heal damaged skin. 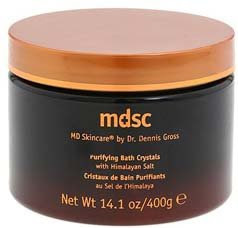 Vitamins A, C, and E, papaya enzymes, and mineral-rich Himalayan Salt enrich the skin and revitalize. Taking the idea of 'going green' a step further, MD Skincare uses recycled materials in all of its packaging. Heads up folks, mango is the hot scent and taste this spring and summer. The folks at Absolut Vodka are known for setting trends and this spring they are launching a new mango vodka right on the heels of some great beauty finds inspired by or containing the delicious fruit. After a long dry winter your skin and hair need some extra pampering. Mango is rich in nutrients like Vitamins A, B, and C and compounds like lupeol which are anti-inflammatory, they are also high in antioxidants and smell delicious. Organic products made with natural ingredients, while in limited supply right now, are sure to become a staple on the beauty counters in the years to come. Get a jump on this beautiful trend.